Just like the people we meet, from a party, from our high school and college life, our childhood, there will always be people we want to keep longer in our lives and sometimes, until our last breath. They either become one of our close friends, best friends, and sometimes, the one we would marry and spend the rest of our lives with. You can also agreement template. No matter how cliche it may sound, we desire the presence of those people always because we trust that they will still stay through our bad times. That goes for companies as well. They also want some employees to stay loyal to them no matter what happens to the company. But with a workplace environment that always has to be formal, retaining such employees can’t be done by word of mouth. This can be achieved through a simple agreement that is called the Retention Agreement. To find out more about this kind of agreement in the workplace, read and understand the following terms below. We will also be providing templates and tips on how to be careful before you agree to the retention agreement or any agreement for that matter. To understand, the retention agreement sample is within the title itself, to retain something or someone for a specific time. The act of retaining something for a period of time is the simplest way to define the word retention. 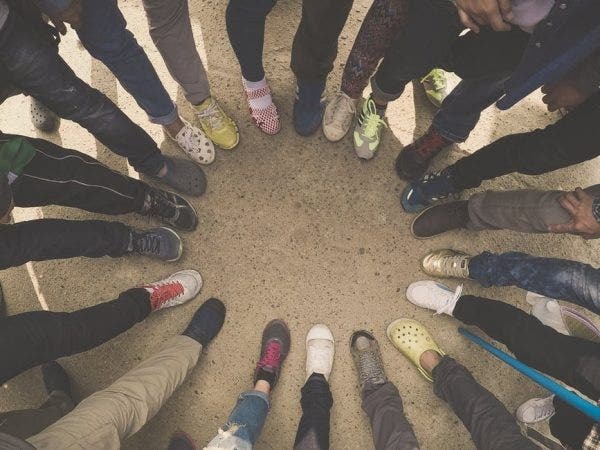 If you take it to the workplace environment, it is generally understood that what the company is trying to retain is their employees, specific employees. They can achieve this if they handout a retention agreement to the employee and would hope he or she would sign it. It is an agreement that would ensure the employee that he or she will stay in the company for a period of time no matter what happens in the executive office and would be guaranteed a retention bonus. It also helps in keeping valuable employees in times of uncertainty once the employee would agree and sign it. Before anything is to be signed, the employee should first and foremost read and understand the agreement. Agreements, just like policies, tend to be so long. It is designed this way because companies should be specific in every general idea they put in their policies to avoid misunderstandings with the employee. 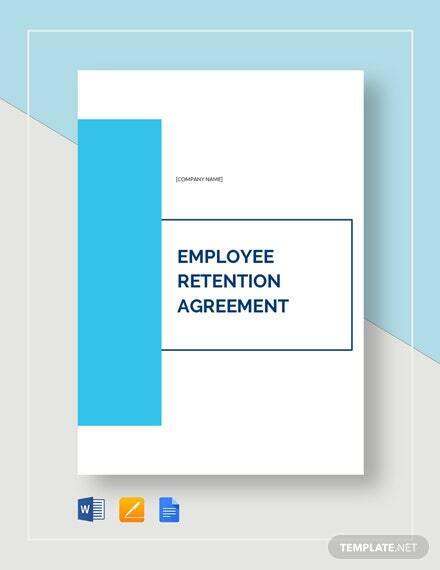 So, if you’re in a situation where your boss gave you a retention agreement or is already making you read their policy about it, read it first, no matter how long or tiring it may seem. I mean let’s face it, sample policies and statements can never be complete with its very own introduction absent from the said document. It usually starts stating that the retention agreement is being read and processed by the employee and the company’s name. No, this is not the recitals you might be thinking about. It does not involve playing the piano or guitar. 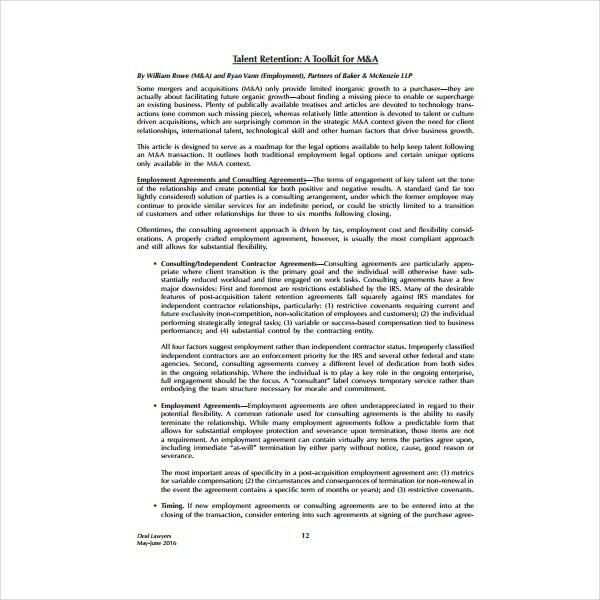 The word recitals sets outs the reasons for the provisions of the agreement. This is where the “WHEREAS” words are established. You may also like free agreement templates. 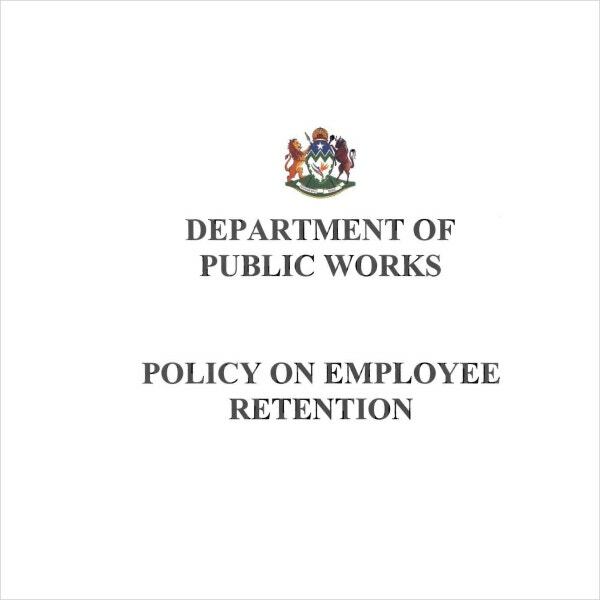 If the employee agrees to the retention agreement, this section of the document will state for how long the retention would take its effectiveness. This is basically called as the ‘Retention Term’ of an employee to the company. The company or the one who drafted the agreement usually is the one who would input how long he wants his or her employee to stay and perform. This part of the agreement would state what would be the employee’s new and old responsibilities that he or she has to look after once the retention term has started. It is understood that if someone is requested to stay with the company, he or she must have been an excellent performer in his/her field of work. This part will be specific in what his/her manager or boss wants him/her to do and be responsible for the remainder of his/her retention term for the betterment of the company. You may also see employee exit agreements. In this section, it will state how much the employee would be getting if he/she decides to stay with the company. The increase in salary should be specific and what bonuses can be received by the employee if he/she is consistent in performing well in the company after signing the retention agreement. This can also be found in the Retention Policy of a company. It is in this section where it would indicate when can an employees retention agreement be broken or would eventually end. Nothing is ever permanent in the workforce and that goes also to their agreements. The termination of an employee happens if the term has already expired, the employee would already wish to resign, or possibly because of one of the saddest moments in life if the employee has died. 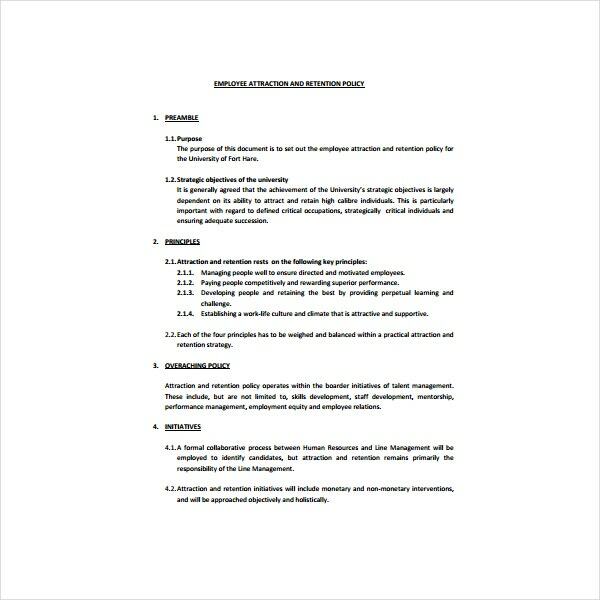 You may also see employee confidentiality agreement templates. Be picky. By this I mean, don’t just only pick an employee who has performed well to negotiate with your Retention Agreement. This does not mean you would not make the top performers in your company the number one priority for you to keep, it is just that there are also other “key” employees you might want to take into consideration even if they are not like the top 1 priority. Sometimes, it is a good thing when people look for success in the most unknown of places or of other individuals. These are the ones who have good relationships with other employees in the workplace. Some are also the ones who have knowledge of his/her line of work and how technically equipped he/she is with it. These kinds of people in the company should be taken into consideration when handing out the employee retention agreement. The manager has to evaluate the effects and consequences if he lets go of this particular employee through reviewing his/her performance and working relationships with him/her and other employees. 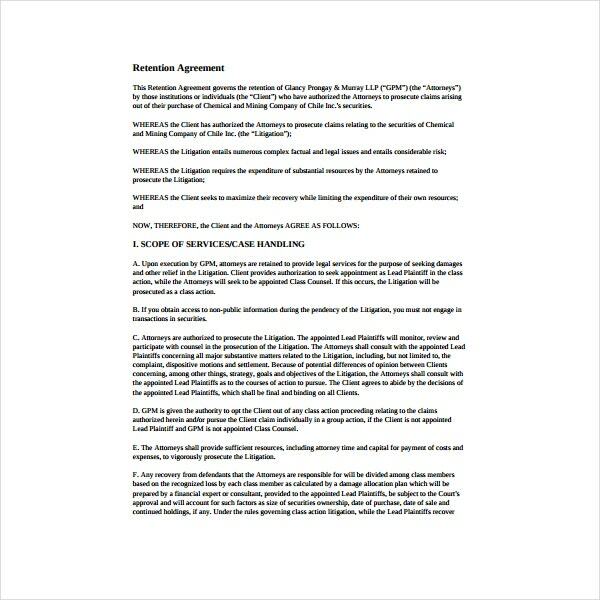 You may also see work agreement templates. 1. Recognization. This means that you should recognize his or her efforts in trying to performing well in the workplace. To be recognized for doing a job well done is such a big confidence booster. You may also like employment separation agreement templates. 2. Get to Know Them. Even if you’re in the workplace, it would not be a bad idea to get to know your employees on a much more deeper level. Having this type of relationship can make your employees be more open to you and would share if ever they are struggling with one task in the workplace. You may also see employment agreements. 3. Let the Environment Be Fun. It would also not be a bad idea to have simple company games from time to time to set aside first the stress of doing work for a long period of time. Try to also set dates where these little games will take place and make sure everyone would participate so that each one would be benefited because of it. You may also see sample incentive agreements. 4. Feel Belonged. Make them feel like this is their second home. By interactive activities, they not only get to know you more but also his or her co-employees from the department and other departments in the office. 5. Encourage them to Sleep Well and Exercise. If you’re the boss, it would be a sigh relief if you remind your employees not to overwork themselves to the point they would not get enough sleep and would gain weight little by little as days pass by. A boss should not only care for his own well being but of the people, he works with too. You may also see incentive agreement templates. 6. Remind them about their Work-Life Balance. It is so important to remind your employees to also value their life outside of work and try to spend more time with it by granting them vacation leaves. 7. Say that You’re Grateful to Him or Her. Telling your employees “thank you” is one way of letting them know that you appreciate not only their work but also their presence in the company and again, this can boost the employee’s confidence. 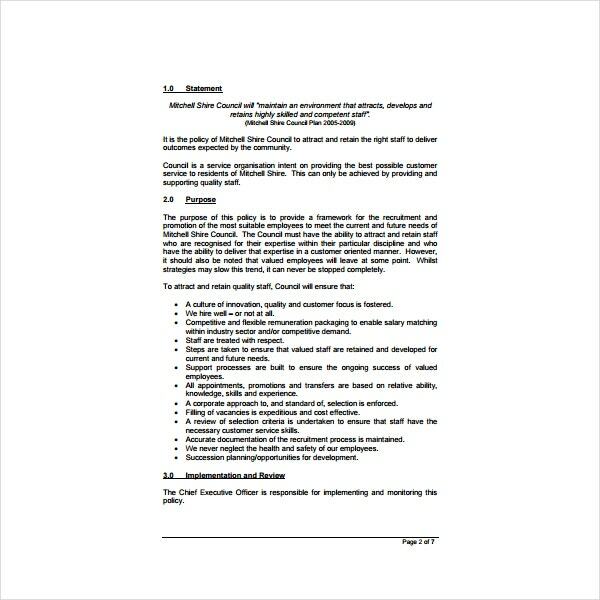 You may also see employment agreement templates. With persistence and consistency, you can make the most valuable assets of the company stay. This is important so that the company’s success would still be there and would continue to grow in the months ahead. With the trusted people still beside you in your journey as an entrepreneur, you’ll be fine as Tricia Griffith, the CEO of Progressive, has said: “With the right people, culture, and values, you can accomplish great things”. 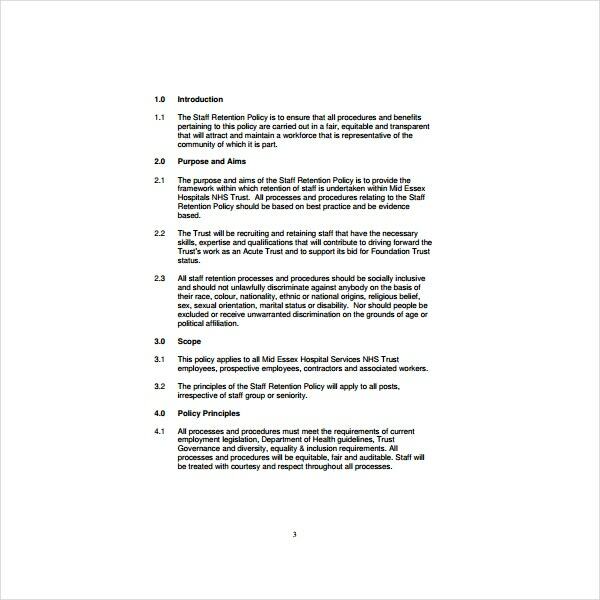 You may also see sample employee agreements.